Anthony Hardcastle, Esq. (d. 1995), Asthall Manor, Oxfordshire (1930-1995). The chairs 'picturesque' splat, arcaded with gothic frets wrapped in Roman foliage, derives from a parlour-chair pattern invented by Thomas Chippendale (d. 1779) and issued in The Gentleman and Cabinet-Maker's Director, 3rd ed., 1762, pl. XIV. The pattern features on a closely related chair illustrated by John Kirk in American Furniture and the British Tradition to 1830, New York, 1982, fig. 1884. It also inspired the splats of a Boston, Massachussetts chair reputed to have belonged to James Swan (d. 1830) of Boston and Dorchester (Kirk, op. cit, fig. 882). A chair with an almost identical splat to the present one, from the Macquoid Collection is illustrated in P. Macquoid and R. Edwards, The Dictionary of English Furniture, London, rev. ed., 1954, p. 279, fig. 167. 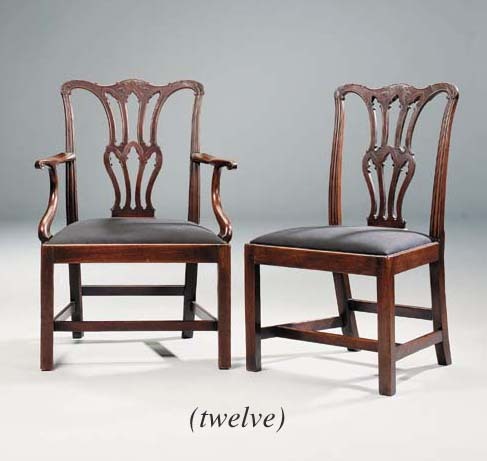 A further set of twelve remarkably similar dining chairs from Castle Hill, Englefield, Surrey were illustrated in the Norman Adams Yearbook, London, 1985. In the 14th Century, Asthall Manor, nr. Burford, Oxfordshire was owned by Margaret, Countess of Cornwall. The house was later remodelled by Sir William Jones in the early 17th Century and it was subsequently bought in 1688 by Sir Edmund Fettiplace. It remained with the latter's family until 1810 when the house was bought by John Mitford (d. 1830), 1st Lord Redesdale (1st creation). David Freeman-Mitford (d. 1958), 2nd Lord Redesdale (2nd creation) moved to Swinbrook in 1926 and the house was purchased by Thomas Hardcastle in whose family it has remained.